Production ergonomics – the science and practice of designing industrial workplaces to optimize human well-being and system performance – is a complex challenge for a designer. Humans are a valuable and flexible resource in any system of creation, and as long as they stay healthy, alert and motivated, they perform well and also become more competent over time, which increases their value as a resource. However, if a system designer is not mindful or aware of the many threats to health and system performance that may emerge, the end result may include inefficiency, productivity losses, low working morale, injuries and sick-leave. 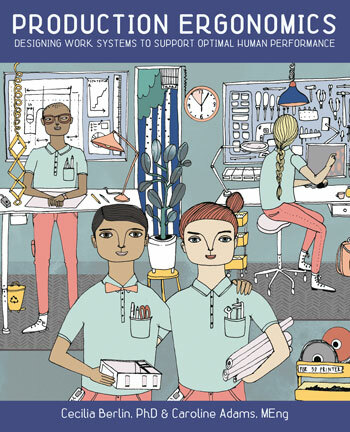 To help budding system designers and production engineers tackle these design challenges holistically, this book offers a multi-faceted orientation in the prerequisites for healthy and effective human work. We will cover physical, cognitive and organizational aspects of ergonomics, and provide both the individual human perspective and that of groups and populations, ending up with a look at global challenges that require workplaces to become more socially and economically sustainable. This book is written to give you a warm welcome to the subject, and to provide a solid foundation for improving industrial workplaces to attract and retain healthy and productive staff in the long run.